How wonderful, and fun, to make new friends. I think you will be pleased to make their aquaintance, to become personal friends with the greatest Bible teachers that God has given the Church. 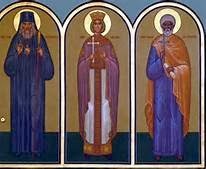 These friends, some of whom knew the Apostles personally, and some who lived through the early persecutions, and others that fought heretics and defined the Holy Orthodox Faith during the time of the "Seven Great Ecumenical Councils"(325 - 787 A.D.). These friends were martyred for the Faith, defeated the heretics, wrote the Nicene Creed, and determined the Canon of New Testament Scripture. Here, I now introduce you to the great Bible teachers of the Ancient Church. Alexandria, Origen, Athanasius of Alexandria, John Chrysostom, Basil the Great, Gregory the Theologian, and Gregory of Nyssa. Another grouping of Fathers is known as "The Desert Fathers" which were the "monastics"(monks and hermits) living in the Egyptian desert starting in the 4th century. Though they didn't write as much as the Church Fathers their influence was also very great. Their short writings are recorded in the "Paradise of the Desert Fathers". The most famous of the Desert Fathers are Anthony the Great, Pachomius the Great, Pambo, Evagrius of Pontus, Macarius of Egypt, and Macarius of Alexandria. St Gregory Palamas and his teachings on the Divine Light, St Sergius of Radonezh, and St Stephen of Perm whose missionary work would pave the way for Siberia, Japan, and Alaska to be reached in the future with the Gospel; St Mark of Ephesus defended Orthodoxy against heresy(15 c.); In the 16th c. Met. Makarii of Moscow wrote his 12 volumes of "Monthly Readings"; St Dimitri of Rostov(17th c.); St Seraphim of Sarov(18th c.); The 19th c. spiritual writer St Ignati Brianchianinov penned "The Arena"; St Nektarios of Aegina, St John of San Francisco, and St Silouan the Athonite crossed over the 19th c. and into the 20th c.
St Irenaeus of Lyons - "On the Apostolic Preaching"
St Isaac of Ninevah - "On Ascetical Life"
St Cyril of Jerusalem - "On the Christian Sacraments"
St Basil the Great - "On the Holy Spirit"; "On the Human Condition"; "On Fasting and Feasts"
St Athanasius - "On the Incarnation"
St John Chrysostom - "On Marriage and Family Life"; "On Wealth and Poverty"; "On the Priesthood"
St Gregory of Nyssa - "On the Soul and Resurrection"
St Symeon the New Theologian - "On the Mystical Life"
St Gregory the Great - "The Book of Pastoral Rule"
St Maximus the Confessor - "On the Cosmic Mystery of Jesus Christ"
St Ephrem the Syrian - "Hymns On Paradise"
St Gregory Nazianzus "The Theologian" - "On God and Christ"
Tertullian, Cyprian, and Origen - "On the Lord's Prayer"
Hippolytus - "On the Apostolic Tradition"
St Germanus of Constantinople - "On the Divine Liturgy"
www.NewAdvent.org/fathers/ Be prepared to read the writings of your new friends!!! www.OrthodoxWiki.org I use OrthodoxWiki to do research.